This week's LOHAS weekly email just arrived, and contains a neat little article detailing results from the Natural Marketing Institute's (NMI) LOHAS Consumer Trends Database™, an annual study of the U.S. general population regarding all facets of green consumerism (LOHAS stands for "Lifestyle of Health and Sustainability -- a prominent green marketplace segment). Sales of other green products have also increased due to declining price premiums (such as the case of renewable power) and improved product performance (for natural household cleaning products). In addition, LOHAS products are also becoming more convenient to purchase thereby requiring fewer trips to specialty retailers. Recycled paper products are widely available at stores such as Office Depot and Staples. And big box home improvement stores are selling natural and organic lawn care products among other eco-related items. NMI believes that the continued growth of green and socially-conscious products will be based on the ability of product and service manufacturers to provide this suite of balanced benefits to consumers. Providing “green” benefits is an important differentiation and provides meaningful value to consumers, but many consumers expect additional (or at least comparable) performance. Particularly for manufacturers who need to achieve a larger critical mass in the market, targeting not only LOHAS consumers but also NATURALITES may be needed, which elevates the importance of products and services being able to communicate the optimal mix of both green and conventional benefits. As such, finding such a “sweet spot” is vital to the success of many green initiatives. As a life-long conservationist, I marvel everyday at seeing "green" being as hot as it's ever been. It's great that as green products become more and more abundant, easy to find and buy, and easy to afford, people are finding that they benefit not just the environment, but also their finances, health, and quality of life. It's also fascinating to watch as marketers push the full suite of these benefits to appeal to more and more segments of the population. There is, of course, a real danger that the desire to continue this mainstream push by searching for a "sweet spot" between environmental friendliness and improved performance ends up generating a flood of greenwashing: products that are green in name and marketing only; whose production and use don't really help curtail such human environmental impacts as climate change, toxic pollution, and deforestation. Let's hope that instead, this mainstream push inspires creative new approaches for making the products that are best for the environment also the best in terms of whatever their target users most value - be it price or overall quality. With critical environmental problems such as climate change and deforestation accelerating, and Peak Oil drawing ever nearer, we need this kind of visionary innovation in the marketplace more than ever. Winged Warning? 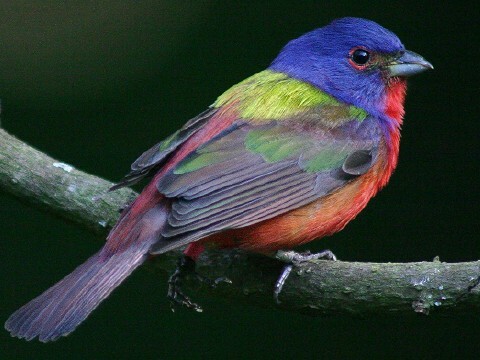 Is the decline of birds a canary in the coal mine that people should take heed of? Another story -- this time an op-ed piece -- about the decline of birds in America. There are some wild places that I visit where I am completely blown away by the sheer magnitude of morning and evening bird singing -- it is symphonically mesmerizing. Still, old timers in those areas often talk of this natural orchestra being nothing compared to what it was just a couple of decades ago. Even in these most wild areas of America. A few weeks ago, I discussed why we should pay attention to such declines in the abundance of our fellow inhabitants of this planet: the potential for humans to learn a lot about dangers to ourselves from species becoming endangered. In the case of Rachel Carson and Silent Spring, it turned out that the causes of a silence during springtime were pesticides that were also silencing people -- substances that proved to be cancerous, reproductively damaging, and more. What does today's bird decline tell us about something that's happening to the environment, which is also affecting us? I'll hedge a bet we'll know sooner than later. The good news then, would be that solving the problem of our declining bird populations will also be good for people in more ways than just preserving our enjoyment of their singing. Quincy, CA (July 20, 2007) -- High Sierra Music Festival , which took place July 5-8 at Plumas County Fairgrounds in Quincy, today announced the final results of their pilot composting program. The festival partnered with local area farmers to keep organic scrap by-products created by its food vendors out of the landfill. In total, approximately 850 gallons of fruit and vegetable waste were kept out of the landfill by the composting team. The team included festival officials, along with conservation biologist, Jon Gelbard of Conservation Value, Bob Hollis of the California Resource Recovery Association, farmers Noel Carlson and Jim Holst of the Quincy Grange, Regional Grange Deputy, Ken Donnell, and Nick Aster of The Triple Pundit. After setting up clearly marked compost bins behind the festival’s food courts, Gelbard informed food vendors of where to dispose of their surplus organic materials (meats excluded – to avoid attracting bears to the farmer’s compost pile). Gelbard, Hollis and Aster then monitored bin levels to see how quickly they were filling up. Once the bins were close to being full, the team would contact farmers Carlson and Donnell to let them know the team was “on” for their pre-arranged evening pick-up. Upon arriving at the festival, Carlson’s blue truck was escorted to the pick-up site, where the group and festival officials used a fork lift to retrieve the bins and dump the contents into the back of the truck. From there, Carlson transported the mixture of mostly fruit and vegetable materials back to her Quincy-area farm, where it was mixed into the operation’s compost pile. The bounty of resulting compost – whose production saved the festival money on waste disposal – will help improve pasture for the Carlson’s locally-grown Icelandic lamb and wool, marketed under the Holst Station label. The festival also introduced the use of biodegradable food utensils this year, and hopes to expand the program to all vendors for 2008. “This is yet another example of how business and land management practices that are good for the environment can also benefit local farms and communities. We started with organic waste that the festival would have had to pay to send to the landfill. But instead, we worked together to cut these disposal costs, and turn this waste into both free feed for farm animals and free compost that is being used to help restore a farm’s topsoil from historic mining damage.” said conservation biologist, Jon Gelbard of Conservation Value. "The Grange is thrilled to be involved with this composting program and the High Sierra Music Festival. This composting program fits perfectly with the California Grange's goal of "Helping Farmers, Protecting Consumers™", and is a perfect example of thinking globally, acting locally,” said Regional Grange Deputy, Ken Donnell. “All of the folks helping with the festival were great to work with! I’m looking forward to meeting up with them again in 2008. For an event of this size, the organization and logistics were fantastic. Our Icelandic sheep and American Guinea hogs thank High Sierra too—they dug for buried treasures in the compost pile and were totally in love with the oranges and cabbages,” said farmer Noel Carlson. “This was a great project to demonstrate sustainable community practices, which is part of the mission of the Quincy Grange”, said farmer and Quincy Grange member, Jim Holst. The festival looks forward to exploring ways to expand the operation in 2008, including by providing recycling bins for bio-degradable food utensils and possibly by providing compost bins for all festival goers. About High Sierra Music Festival (www.highsierramusic.com): High Sierra Music has been producing world-class music festivals since 1991. An independent production company based in Berkeley, CA, the organization was founded with the first High Sierra Music Festival, its cornerstone event that takes place every July 4th weekend in Northern California, and remains committed to its grassroots origins by drawing support from its loyal community of patrons, staff, volunteers and non-corporate sponsors. For U.S. policymakers and business leaders who continue to push for slow, gradual steps to both fight climate change and dramatically reduce America's dependence on oil, a new report released by the International Energy Administration (IEA) this week - summarized in this stark analysis by Chris Nelder - provides a sobering dose of reality. On Monday this week, they had what I would consider a "come-to-Jesus moment," walking before the whole world to the front of the tent, admitting their unworthiness and publicly confessing their sins. Despite four years of high oil prices, this report sees increasing market tightness beyond 2010 . . . It is possible that the supply crunch could be deferred--but not by much. That was enough to set blogs and presses and email systems afire the world over. I was deluged with emails and phone calls about it. So I checked it out. It's a decent piece of work, 82 pages with lots of good charts and data. It was also a welcome break from the delusional projections that the IEA has made for its entire 30-year existence, consistently predicting that supply will magically meet whatever the demand was projected to be. Because for the first time, the IEA admitted that they have some doubts about oil supply keeping up with demand. So does reducing our dependence on oil still require slow gradual steps to prevent 'wrecking the economy' now? Or will taking slow, gradual steps now just ensure that the economy falls to pieces in a couple of years under the weight of a severe oil shock - because we didn't act fast enough to reduce U.S. oil demand in time to get ourselves ready for the arrival of the Peak Oil train? Given the findings of this report, these are crucial questions that our leaders need to answer now. Wow. Nothing short of overwhelming! All this as our policymakers propose renewable energy legislation that is meek compared to that of Germany, Japan, and California. And while they are forced to slug it out with Detroit over making moderate (and vastly inadequate) changes to fuel economy by some year over a decade from now. How will history judge their lack of action? The good news, of course, is that both of the frightening problems described above - Peak Oil and climate change - are really opposite sides of the same coin. The same high levels of carbon emissions that are causing and accelerating climate change are also a result of a 'modern' lifestyle in which humans are slurping up our oil supplies at absurdly unsustainable levels, putting our environment, economy, and quality of life in great danger of collapse. Thus, taking "Apollo Project" type actions to both reduce our demand for oil (and other fossil fuels) can help solve both problems - the old kill two birds with one stone! That would mean less risk to our economy and quality of life posed by both oil shocks and climate change, less pollution-causing cancer and asthma in ourselves and our children, less need to spend taxpayers' $billions fighting energy wars in distant lands where the natives hate us (and thus greater ability to cut taxes), and more money in all of our pockets as more efficient technologies require people to purchase less fuel and electricity to operate them. In other words, the solutions to Peak Oil and Climate Change will help sustain our environment, economy, and quality of life alike! This is a big reason why people talk about sustainability and the benefits of going green. It just makes so much sense to both people and planet! But will these solutions come to pass in time to avoid having to implement them out of some dire necessity? GreenerBuildings has posted a short article by distinguised UC Berkeley Professor, Daniel Kammen, titled, What Solar Power Needs Now. It discusses the types of government programs that have helped accelerate the development and installation of solar technologies in places from Germany to Japan to to Kenya to California. A tremendously compelling case...is that of the Sunshine solar energy program in Japan. Over the course of almost two decades, starting in the late 1980s, Japan developed and then implemented a remarkably coordinated, well-designed solar development and dissemination effort. The Sunshine program is not just pretty on paper, it really worked. During the program annual PV installations grew to over 300 MW of solar/year, and the rate of cost decreases grew to almost 10 percent year. With intelligence websites such as Debka warning of yet another imminent Middle East war, which could send energy prices through the roof, the types of programs described in this article need to be implemented at a wide scale around the world with the greatest of urgency. They will help fight climate change, reduce the ecological, health and economic impacts of fossil fuel-derived pollution, and to boost our energy and economic security in the face of increasingly unstable fossil fuel supplies and prices. The good news is that the proliferation of such programs will be coupled with a current rapidly advancing state of solar technologies - both in terms of solar panel power generation and in terms of battery storage. For example, have a look at this article and this one - it's some hopeful stuff! Once again, the solutions are there - or very much on the way. Hopefully it doesn't take a disastrous explosion in Middle East hostilities to motivate the actual policy actions Professor Kammen calls for. This is my favorite kind of Conservation Value story: a new report from Goldman Sachs details significant findings regarding the business value of sustainability. A report released at the (UN Global Compact Leaders Summit in Geneva) summit by Goldman Sachs (Download-PDF) showed that among six sectors covered -- energy, mining, steel, food, beverages, and media -- companies that are considered leaders in implementing environmental, social and governance (ESG) policies to create sustained competitive advantage have outperformed the general stock market by 25 per cent since August 2005. The argument that doing what's right for the environment harms the economy continues to crumble. Most are policy and tax solutions (forcing utilities to purchase minimum amounts of renewable energy, passing a carbon tax), but one event is absolutely going to happen - the 2008 Presidential election. Goldman believes that regardless of the party of the winning candidate, he or she will favor the proliferation of renewables. Good news for the climate. Good news for us!